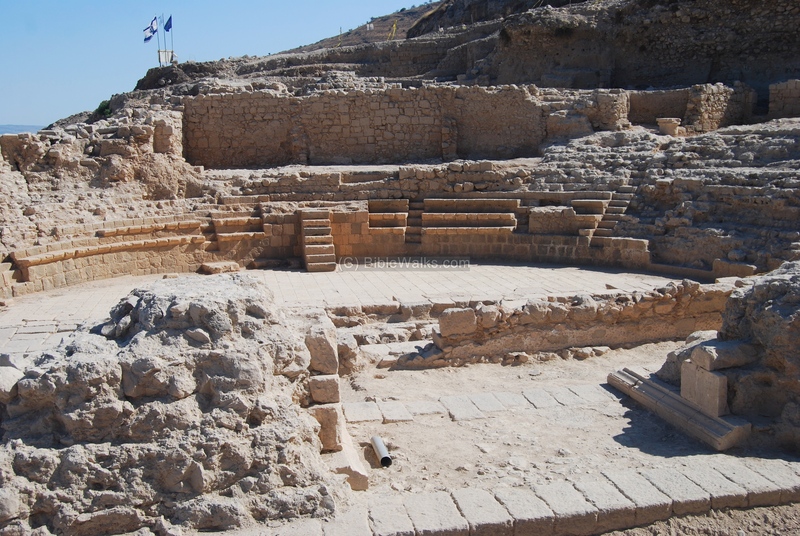 The Theater of Roman Tiberias is recently excavated and reconstructed. Constructed in the 1st C AD, enlarged in the 2nd C, it had seating capacity of 7,000 people. 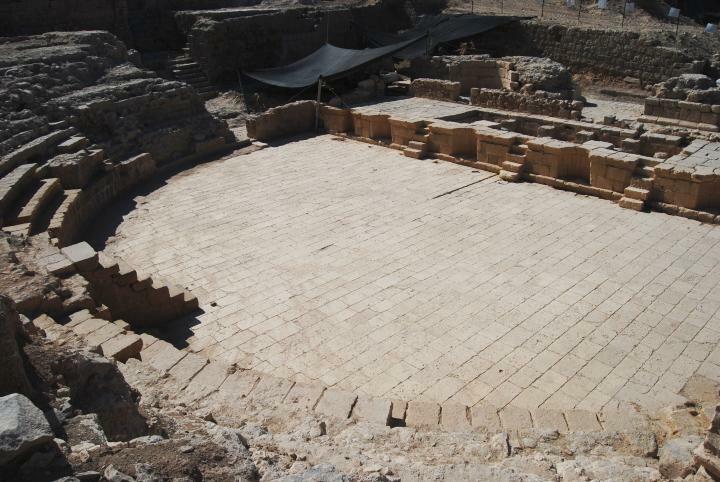 The Theater of Roman Tiberias is recently excavated. 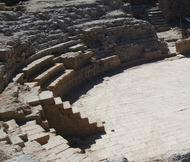 The Theater was constructed in the 1st C AD, enlarged in the 2nd C, and had seating capacity of 7,000 people. The site is located on the southern side of Tiberias, near the ancient cemetery of Tiberias. 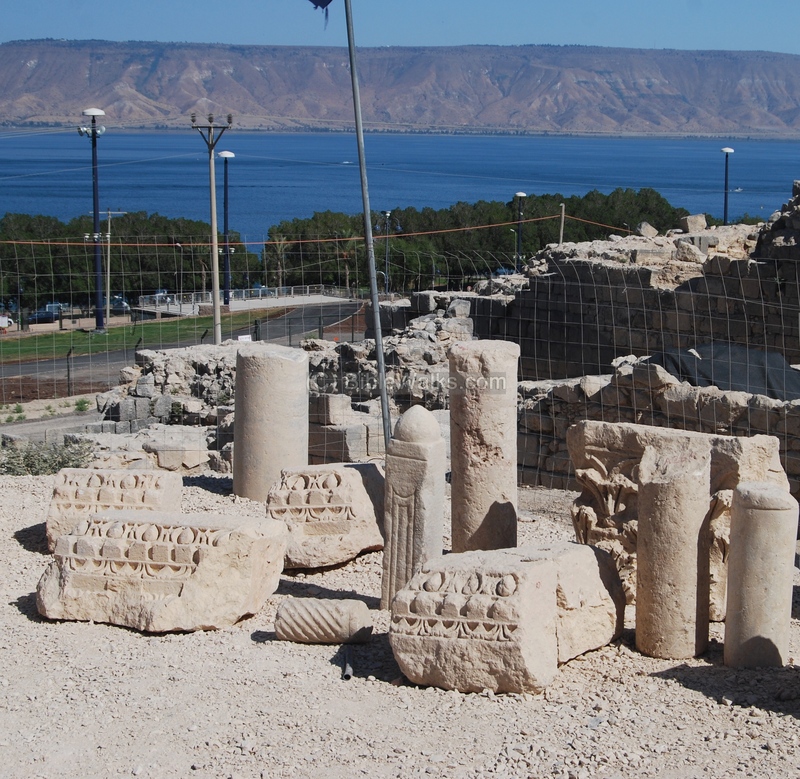 It is part of the newly constructed archaeological park of Tiberias. An aerial photo is shown below, indicating the major points of interest. You can point on the yellow points to navigate to the selected point in this page or other pages. 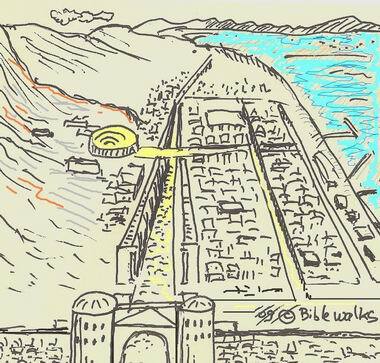 Tiberias was founded in 18 AD by Herod Antipas, son of Herod the great and Jewish ruler of the Galilee (4 BC-39 AD). He was appointed by Augustus Caesar as the ruler of Galilee and Peraea, the east bank of Jordan. 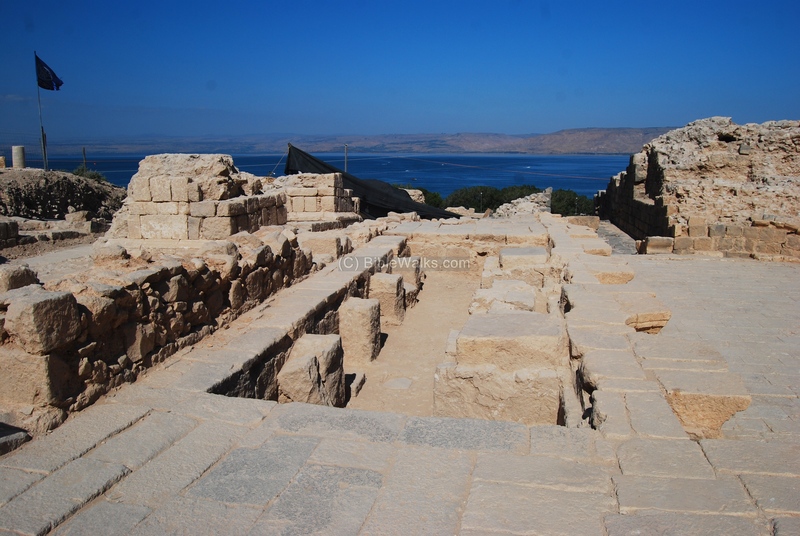 Herod Antipas made the new city his capital, and named the city after the Roman emperor, Tiberius Caesar. 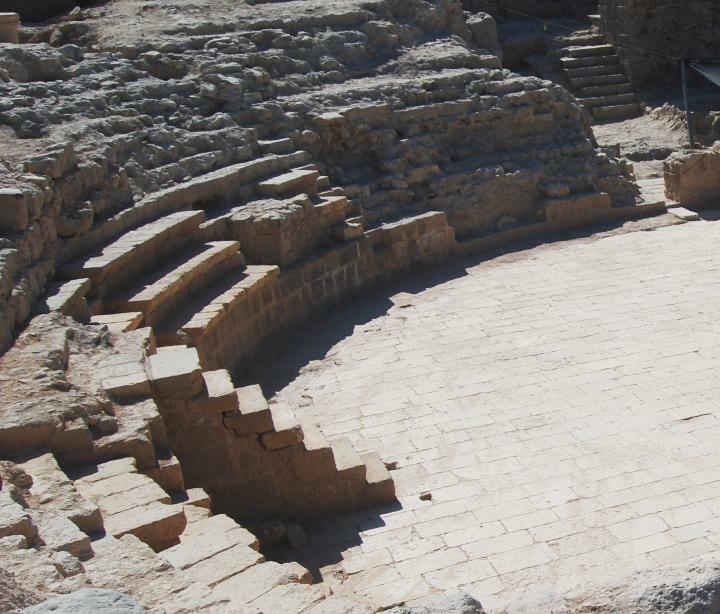 The Theater was an important element in all Roman cities, and this included the newly founded city. 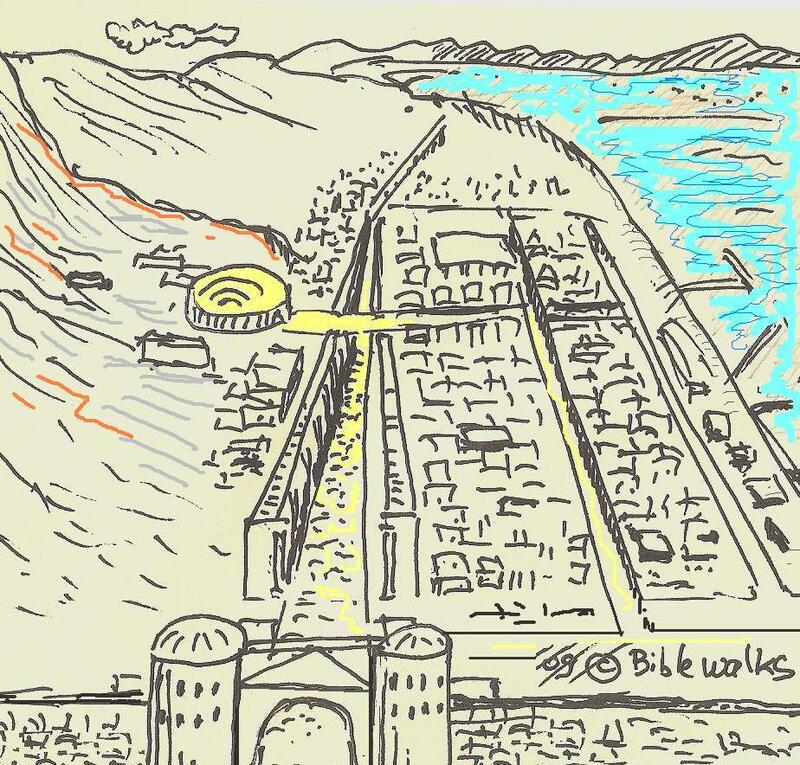 In Tiberias it was located on a higher level above the city, close to the main south-north colonnaded street (see sketch on the right - highlighted in yellow). 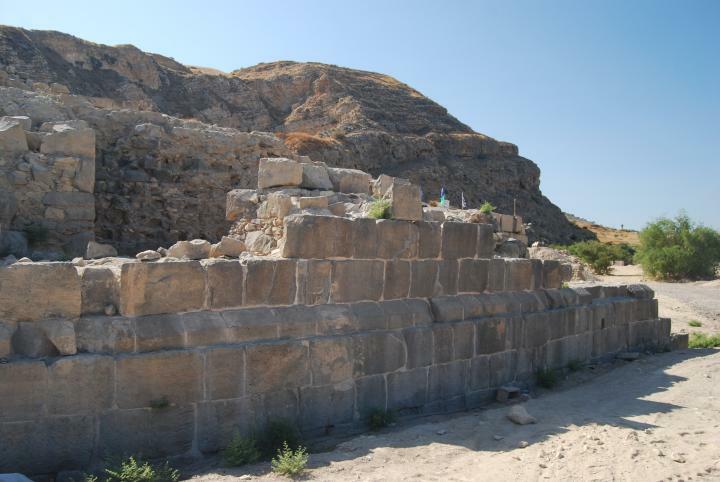 This monumental structure had a seating capacity of 7,000 people, and was oriented south to north. It was first laid out during the foundation of the city, then significantly enlarged in the 2nd or 3rd C AD. 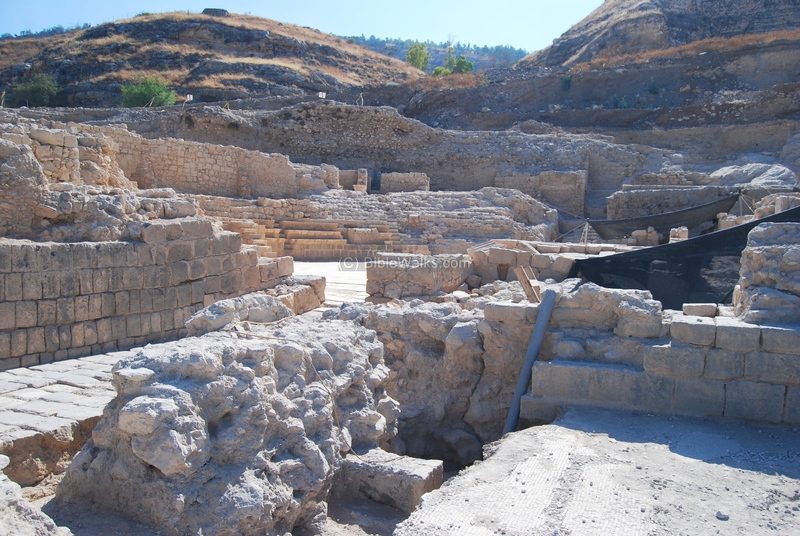 The theater area was incorporated into the new archaeological "Berko" park in Tiberias. This grand project, launched in 2008, covers an area of 100 dunams (10 Hectares). 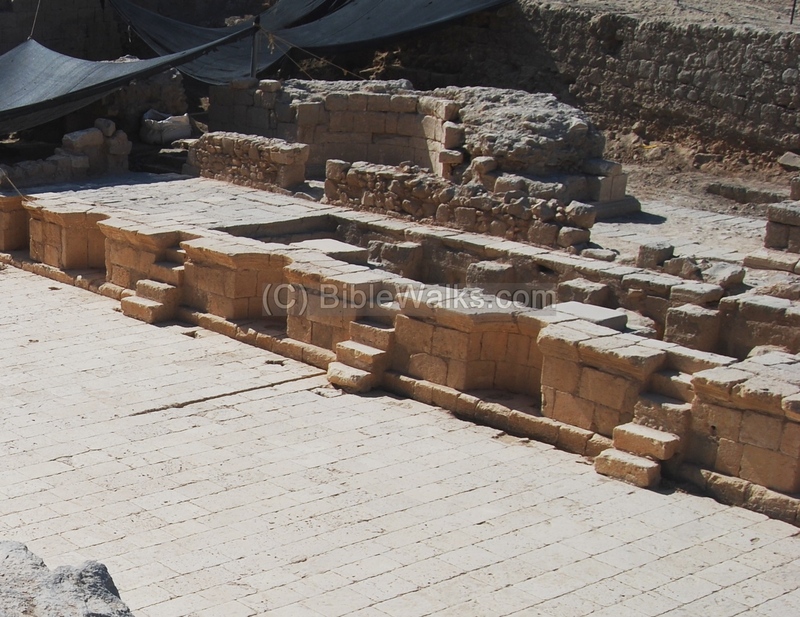 The park reconstructs the old city of Tiberias from its establishment in the 1st C AD up to the Arab period (11th C). The theater will be used for live performances. "The first signs of a monumental structure hidden underground were discovered in the early 1980’s by Yossi Stepansky, an archaeologist with what was then the Department of Antiquities. In a survey he performed there he discerned three cornice stones that were poking out from among the soil and debris. 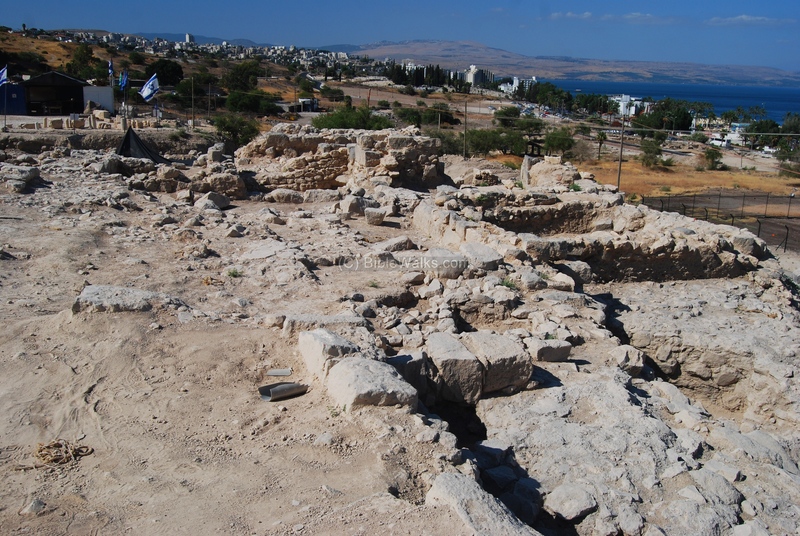 In 1990 intensive excavations commenced in this region at the initiative of Amir Drori, who had just assumed the role as director of the Israel Antiquities Authority, and which were headed by Professor Yizhar Hirschfeld, on behalf of the Hebrew University of Jerusalem. 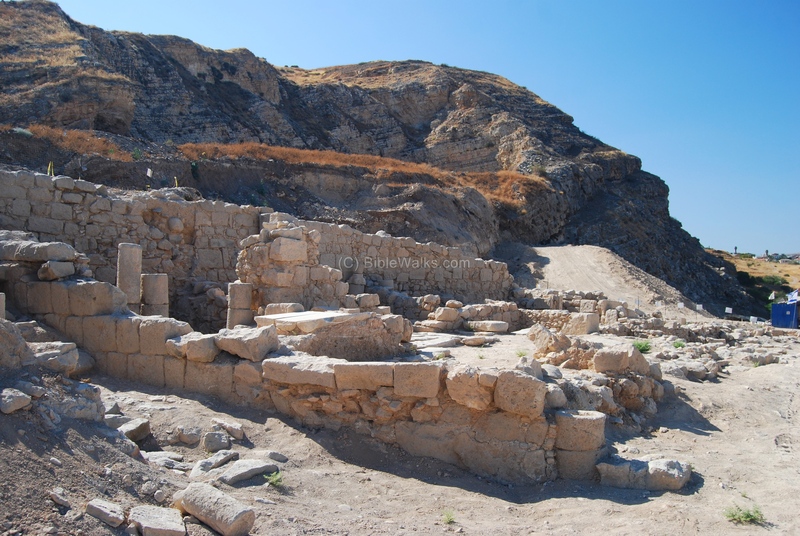 Already at the start of the excavations archaeologist Edna Amos noticed a curved wall… and immediately everyone realized that this was none other than the Roman theater of the city of Tiberias. The theater is more than 1,700 years old and it was preserved thanks to the mountains of quarrying debris and refuse that covered it and protected it from being completely destroyed. The theater’s structure is enormous. Today we know that it is c. 80 m in diameter and it had a seating capacity for approximately 7,000 people. The seats in the theater face north so that during performances the sun would shine on the back of the spectators. We envision that the theater will once again soon be used for giant performances". A view of the theater, from the stage area in the north side, is seen below. Only part of the blocks of seats remained, and the reconstruction is still in progress. After it will be completed, this Roman theater will be used for live performances. Another view of the theater, as seen from the south side, is seen below. The orchestra is semi-circular in shape (18M diameter), paved with limestone flagstones. The photo below is closer view of the seating area. 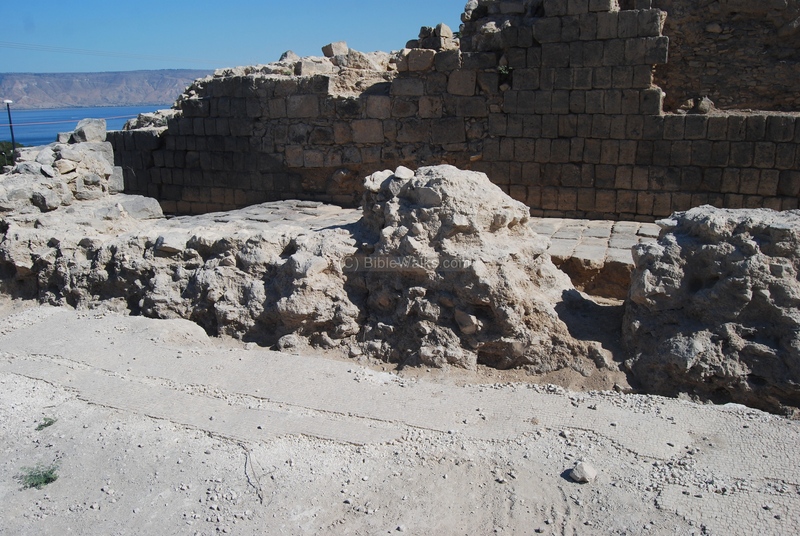 The excavations uncovered the remains of the lower block of seats, one of three, and the remains of the peripheral corridor which separated this block and the middle block. The stage (6 x 30 m) was partly paved with limestone and basalt flagstones. The archaeologists date the stage to the end of the fourth century CE. The stage house, seen below, was built of two parallel walls with a 3 meter wide space in between them. There are three openings in the front (south) wall of the stage house, and podiums stood between the openings at the front of the stage house. These podiums carried columns that held beams that decorated the front wall of the stage house. The front wall was decorated with alternating semi-circular niches and rectangular niches. In three central rectangular niches are five-step staircases which connect the orchestra with the stage, as in the picture below. A detail of one of the semi-circular niches is seen below in detail. 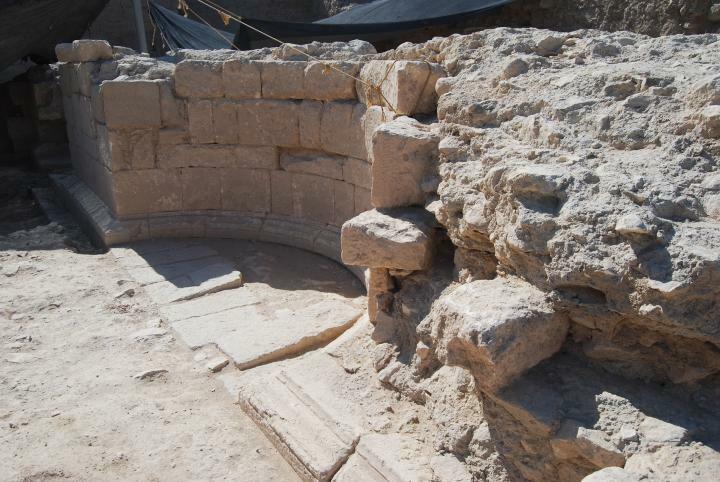 The excavators reported on architectural elements that were discovered in the excavation that belong to the decoration on the front wall of the stage house. These limestone elements Corinthian capitals, architraves, friezes and cornices. 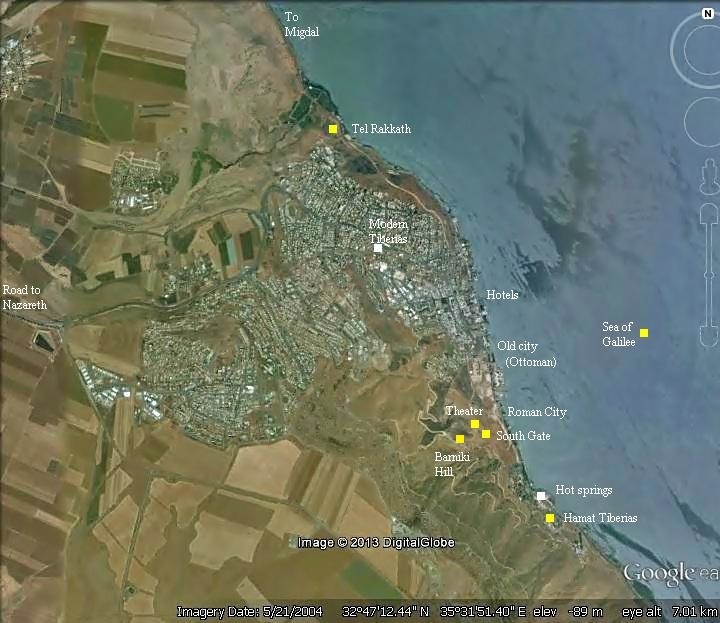 Some of these findings are seen below, with the Sea of Galilee and the Golan heights in the background. In the northeastern corner of the stage house is a staircase that led to a structure with a 3rd-4th C mosaic floor with a Greek inscription, seen below. The eastern entrance to the Theater is seen in the photo below. A staircase is located on the left (east) side, which led to the city and the main south-north street. The eastern external wall of the Theater is seen below. An area above the remains of the theater was used in the Arab period as a residential quarter. A picture of these housings is seen below. The ten houses, street and alleys that were exposed are dated to the Abbasid period. The builders of these houses reused the theater seats as their building blocks, a common practice in most ancient sites.